Can’t see one of these without thinking of Hank Kimball, the county agent (below) who was one of Oliver Douglas’ foils on the 1960’s sitcom Green Acres. 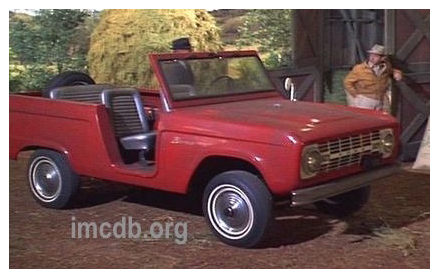 This 1967 Ford Bronco pickup was one of three available body styles introduced a year earlier to compete with Jeep. A station wagon and a roadster (like Kimball’s), were also available. This blue pickup was seen a few summers ago at an AACA car show at UB in Amherst.